"Students in my lab work on multiple projects with close supervision from graduate researchers and myself; they participate in various phases of research in collaboration with other members in the lab," Wang says about the learning opportunities available. "Nothing can beat the cuteness of babies," shares Wang about the popularity of her research program - which is the largest in the department. 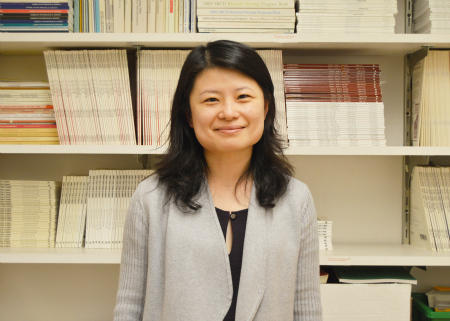 Psychology professor Su-hua Wang is a world renowned expert in early cognitive development. 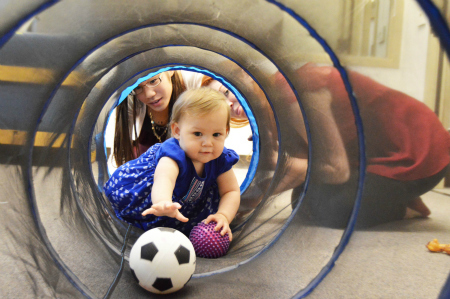 Her research explores early cognitive development in children, focusing on how infants learn a new concept. She’s showed how babies use vocal cues to help identify jokes and helped parents read their baby’s mind. She’s also proven the advantages of hands-on learning and discovered ways toddlers perceive tone. We sat down with Wang for a Q&A to learn more about her work and about the unique research internship program she offers to psychology majors. Q: What is the most intriguing thing you discovered about infants and learning? SW: Recently our lab found that when infants face challenging tasks, such as making a new toy work or intuiting their physical surroundings, parents in different cultural communities provide different support for their babies. For example, parents in Taipei spontaneously guide their babies by holding their hands to demonstrate how to operate the toy or how the rules of physics work with objects. In contrast, parents in Santa Cruz tend to rely on infants’ own exploration. One might expect these different approaches to result in different outcomes with free exploration being more effective than physical guidance in helping infants learn. However, we discovered that babies in both communities learned equally well, as long as parents engaged them in the practice that was familiar to both of the parties. Our research points out that even for infants, learning can occur in various forms. It is vital to consider the interactions between parents and infants. Q: What are some common misperceptions about children and development, and how does your research address that? SW: There are many resources out there that provide suggestions about universally best practices for child development. For example, when searching online, parents easily come across a timetable that specifies the age at which a particular skill or ability should be developed and suggestions of activities that help a child develop if the timeline is not followed. My lab questions the timetable of learning in infancy; across studies, we show that whether infants demonstrate an understanding or ability depends on many situational factors. 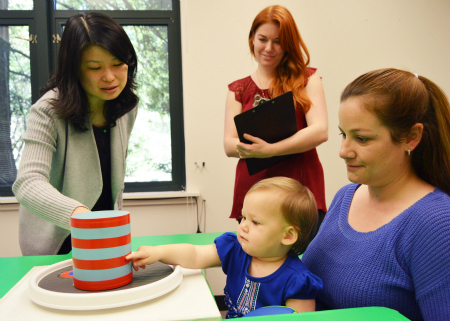 The mind of infants is extremely flexible; in some cases, even brief experience of a few seconds can make a difference in how babies perceive and react to the world. Our research also suggests that infants benefit the most from experiences that are sustainable in the family—things that parents feel comfortable engaging their children with in their everyday life. Q: What is the one piece of advice you would give to parents about their baby? The best advice comes from your baby. Q: Congrats on being voted the best research lab in the department! What makes your lab popular with students? SW: Many students are drawn to my lab because of their interest and curiosity in infant development. Students in my lab work on multiple projects with close supervision from graduate researchers and myself; they participate in various phases of research in collaboration with other members in the lab. They may jointly design and set up new studies, conduct a study with young children, or help analyze quantitative and/or qualitative data, etc. Students seem to appreciate these collaborative, hands-on experiences very much. Plus, nothing can beat the cuteness of babies. Q: What is a research internship like at your lab? What do students do? SW: At the beginning of each quarter, students receive in-depth training and practice the responsibilities relevant to their roles. Over the course of two quarters, students will be involved in many aspects of research. Some will conduct research tasks with babies or act in a scripted show for babies to watch; others are assigned to observe babies’ reactions to these shows. When possible, students are rotated to a new position after a quarter to experience a different set of research activities, including the design and set-up of a study, subject recruitment, data collection, coding and initial analysis of research data. Work is always collaborative. Students work closely with graduate student researchers and myself, and participate in regular check-ins and meetings. Q: What advice do you have for students interested in research and psychology? SW: It is very helpful to get hands-on experience with psychology research and first-hand information about how a researcher begins and travels through the journey of a scientific inquiry. Be open-minded in getting involved in projects that may seem challenging or not immediately relevant to your current interest. Even for students who want to pursue applied psychology, research experience can provide inspirations to help them clarify their interest. Q: UCSC is known as “the original authority on questioning authority.” What is your question? SW: My research questions the assumed universal pathways of infant development and seeks to bridge early learning and cultural diversity.